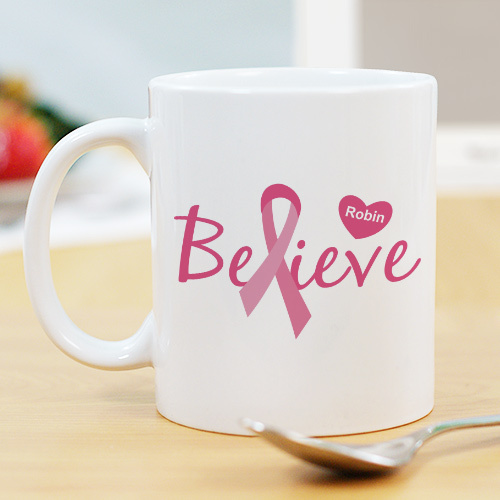 Believe in the fact that we will one day find a cure for breast cancer and show your support for those going through this challenging time with a Personalized Believe Coffee Mug. A thoughtful, personalized gift which simply states it all - Believe. Your new personalized breast cancer awareness ceramic coffee mug is dishwasher safe, and holds 11 oz. Includes FREE Personalization. Personalize your Believe Coffee Mug with any name. Additional Details Personalized Breast Cancer Awareness Gifts are personalized with care and exacting craftsmanship. We take great pride in offering the finest collection of Personalized Breast Cancer Awareness Gifts online.